Lomond Books | Wholesale Books, Calendars, Postcards, Maps, Scotland | Lomond Publishing | Book Distribution Farmer's Away! Baa! Neigh! 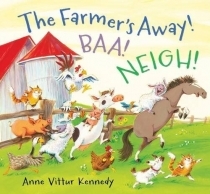 In a rhythmic read-aloud picture book, brimming with the irresistile sounds that farmyard animals make, Anne Vittur Kenny wonders, What mischief do the horses and cows and sheep get up to when the farmer's back is turned? Well, there's boating (of course! ), as well as a picnic, a rollercoaster ride, a hot-air balloon, ballroom dancing and ... oh no! Could that arf! arf! arf! mean the farmer's heading back? Even the youngest of listeners can read this book aloud by following along with the pictures and making each animal's trademark sound.